Jan and Lonnie love the jewelry, folk art and textiles we have collected over the years. But, finally, a whole bunch of it just has to go to make room for all the exciting new “finds” on their way. It's that time of year again. As the weather gets cooler, perhaps with some frost on the ground, we start pulling out sweaters and jackets and coats to keep us warm throughout the winter. At Rose Brooks Center, the women and children that arrive for shelter from domestic violence often come without coats and many times without any additional clothing besides what they are wearing. Why Is A Quilt Being Pieced Together In a Brookside Boutique? This week a sewing machine has been humming in the middle of World’s Window, the eclectic world folk art and clothing boutique in Brookside. During pauses in regular retail “busy-ness,” staff have perched at a table to cut quilt squares. Customers stop by to ask about the project at hand and share their own stories of making, collecting or receiving gifts of quilts. Read more about Why Is A Quilt Being Pieced Together In a Brookside Boutique? Over 850 nearly-new and gently worn garments hang in size-runs, ready for this Thursday's "Fabulous Flipping Favorites" clothing drive for Rose Brooks Center, Kansas City's largest domestic violence agency. Our 8th annual spring fund-raiser on Thursday, April 18 from 6 - 8 pm (hopefully outside in front of our store) will provide needed clothing and funds for the women at Rose Brooks. We'll hold the sale, rain or shine! This Saturday Yes, right in our store. Our own Arlene Williams, who is a licensed massage therapist will have her massage chair tucked into a corner of our back room to treat you to a mini-massage of 5 or 10 minutes. Maybe a hand massage. Perhaps a neck and back massage. This will no doubt be the BEST $5 or $10 you will spend on yourself all holiday season! This Saturday, Dec. 1, starting at 10 when we open. These little treat appointments will be first-come-first-served, so come early to get your name on her list. We are hosting a holiday shopping party Tuesday evening, November 13th from 6 - 8 pm. 15% of all proceeds will benefit the programs of Kansas City Young Audiences. Everyone is invited to join us for a fun evening of holiday shopping, tasty refreshments, drawings for prizes and free festive gift wrapping. Join us for a night of creativity & shopping for a cause. This year we're combining our annual coat drive for Rose Brooks with the benefit sale of our fair trade, block-printed bags from India and mixing in a hands-on block-printing project for you to create your own customer decorated gift box or greeting cards. 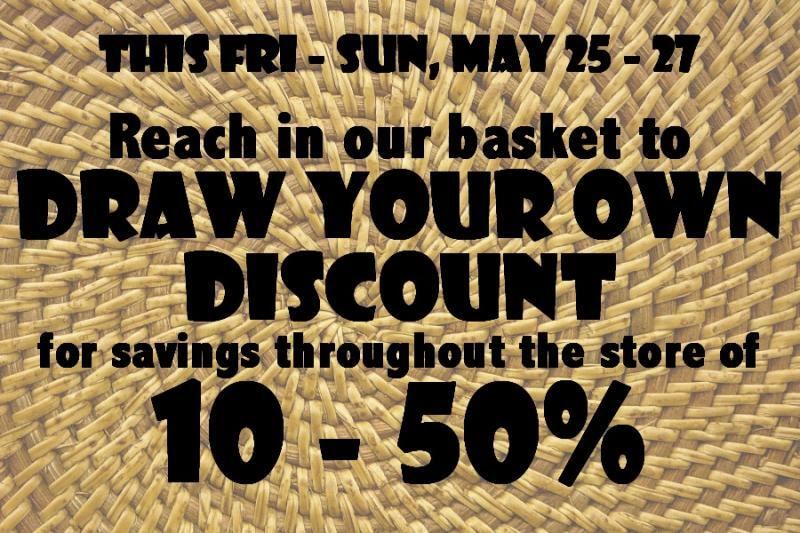 Save 10 - 50% off this Friday - Sunday, May 25 - 27 - by drawing your own discount out of our basket. 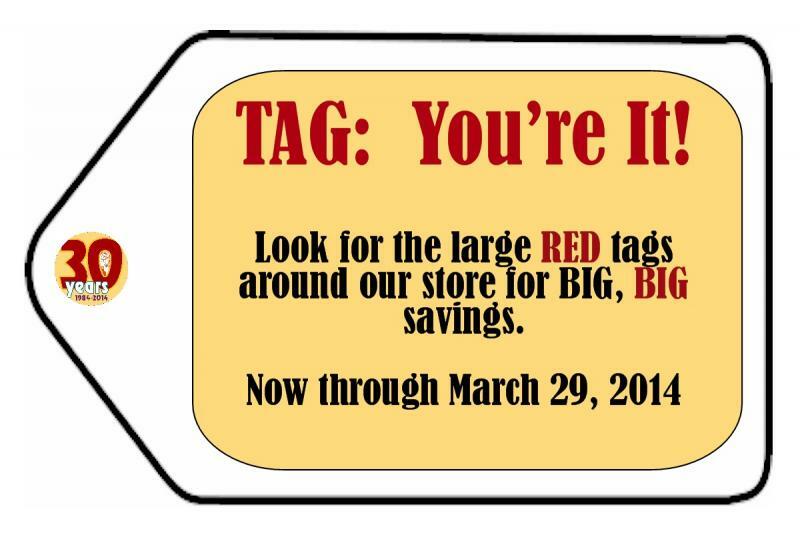 Bring your family along - you can each draw - and you can use the biggest discount for your purchases. Coming alone?? Print off this flier and we'll let you draw DOUBLE as a special friend of World's Window!